FURTHER UPDATE OCT 26TH: SEE COMMENTS IN COMMENT BLOCKS BELOW. 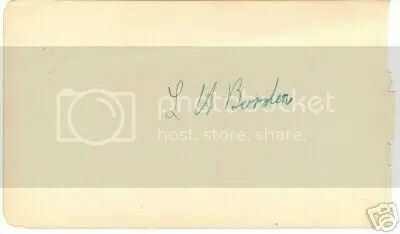 There’s a current auction on eBay purported to be Lizzie Borden’s signature. You can check it out here. Seems pretty slim to me. I would think the Seller’s “mum” would have kept the Boston seller’s receipt or notation of date of purchase, have kept track of the book itself, and so on if these were such coveted “treasures” from her mother passed on down to her.I have a hand carved wooden sewing box which belonged to my great-great grandmother who came to Hawaii from Portugal (yes, I’m part Portuguese). The box was originally made by my great-great grandfather in Lisboa, given to his bride as a wedding present. Thus, my maternal great-great grandparents took this sewing box with them when they sailed to Honolulu, Hawaii to work in the pineapple fields. It still has items from her day in it such as needles, thimbles, threaders, cloth swatches, small scissors, and threads used by her and my great grandmother, grandmother, and mother as well. I’ve included an index card with their names, dates of birth, dates of death, when they were given the sewing box and when they passed it on to whom and where. They coveted this beautiful sewing box and so do I. 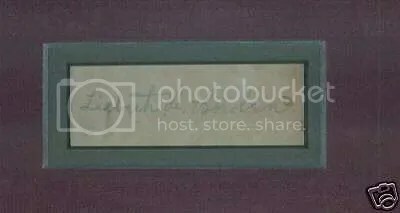 It is because of my experience with this item that I tend to doubt the Seller’s reply as given.There are many known and authenticated signatures of Lizzie Borden, aka “Lizbeth A. Borden” as published in any number of books, journals and periodicals. Just Google “Lizzie Borden signature” and any number of them will come up, the first being this one. It had an eBay “Buy it Now” price of nearly $4,500, but I believe this one is real. Apparently, it wasn’t worth that much. At least not to any eBay bidder because it didn’t sell.I’d write more about this but I need to baste a tape on a garment. Excuse me while I reach for my sewing box….. Sorry it took so long to get back to you but, believe it or not, we have been busy beginning to decorate the museum for the holidays. The curator, Michael Martins, and I have both compared the signature you have to those in our files and this is what we have come up with. The “A” and the “B” in Borden are very much like those in existing samples of her handwriting. The only part that is not consitent with examples of her signature is the manner in which signed the name “Lizbeth,” although the “T” is crossed in a style much like hers. We can’t say 100% that this is her signature for a couple of reasons. One, the image is not very clear. The other is that we have never seen any example of her signature that is not in ink. The only pencil signatures that we have come across were usually in old books and very unlike her handwriting. There were an awful lot of books that people were trying to sell as part of her library, but it was obvious that someone had smudged the pencil to make it look old. As far as your example, I will say that there are very many similarities to her signature. Do you still have the prayer book that the page was taken from? She would have only signed “Lizbeth” after 1904-5, which is when she began referring to herself by that name. If it was a prayer book from this period, or after, that would be another clue to pinpointing it as her handwriting. Sorry I can’t say absolutely that it is hers, but it definitely has the look of hers and is very close to the real thing. I hope this information is helpful and feel free to contact me if you have any questions. I would be more than happy to foward the original email to anyone wanting proof of this, as I am sure there will be doubts and accusations that I wrote the email myself – also please feel free to contact either Mr. Binette or Mr. Martins at the FRHS if need be. The signature I have now seems far more authentic than the others seen, even stumping the experts. So, all in all, it seems to be yet another mystery left unsolved concerning Miss Borden. I’m sorry you’re upset. I thought I was doing you a service by posting your response and acknowledging it may not be her signature…which is pretty much what Michael is saying. Therefore, you cannot, ethically, try to sell it on eBay or anywhere else as being Lizzie’s signature. It would be best to say that it “MAY” be her signature. Please understand, just as Michael said, there are many out there who pass off Lizzie’s signature and Lizzie items as hers, which are not, and many have fallen victim to such scams. I think you are motivated to doing the “right thing” and I commend you for that. Also, blog comments are usually buried, i.e., not noticed by people reading the blogs, and I would like to post this email on that particular blog entry if you don’t mind. characteristics in the capitals but looks traced, the lower one is clearly a forgery.